Wolsingham is situated on the A689 between Crook and Stanhope in Weardale. The first Wesleyan Preaching House in Wolsingham was built in 1776. 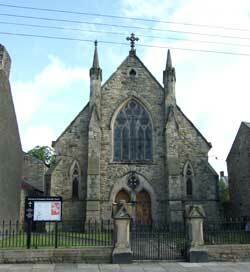 The present Wesley Chapel, facing the High Street, was opened in 1862 and is a large ‘traditional’ chapel. The interior has been extensively refurbished making it more accessible for the wider community and church members. Our church is an all age family and we aim to make you feel really welcome and feel at home with us. Mondays: Drop-in 9.30 am till 12.00 noon. Contact Rev. Bruce Sawyer for more information. 01388 528245. Saturdays: Coffee Mornings 10.00 am – 12 noon: Held every 4 – 6 weeks as advertised locally. Our premises are available to hire for: £7.00 per hour session for the Cafe area, if you need the main church plus the cafe, the rate is negotiable. Carpeted Coffee Lounge/Hall with beverage bay. Worship area to comfortably seat 100, plus small meeting room. Toilets with disabled access and baby-change. Excellent acoustics; outside space with car-park to the rear. Perfect for Weddings: Christenings; Afternoon Tea parties; Concerts etc.